We highlighted the premiere of Syfy’s Metal Hurlant Chronicles last week, but damned if there isn’t a compelling reason for us to give it the spotlight again this go-round. If you recall, Metal Hurlant Chronicles is a Franco-Belgian science fiction anthology series based on the comics magazine of the same name, better known to American audiences as Heavy Metal. Each half-hour episode is a self-contained story, with the one linking device being an asteroid zipping past the Earth during each tale. Syfy is serving up two episodes in a row on Monday nights, and tonight’s first episode, “Master of Destiny,” includes one name we’ve been bandying about here at GFR quite a bit lately: filmmaker Alejandro Jodorowsky. For every movie that makes it to screen, there are dozens that die along the way. A producer commissions a screenplay from a screenwriter, then hires a director, and then starts hiring artists and technicians to bring the movie to life…but sometimes it’s not enough. 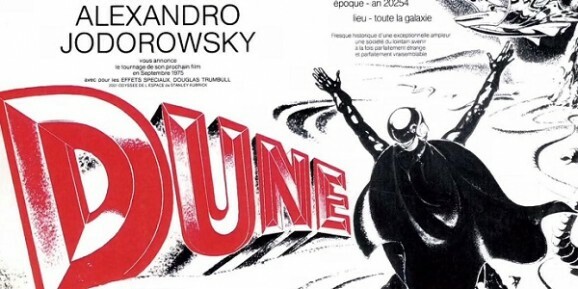 One of the most legendary unmade science fiction movies of all time was Chilean/French director Alejandro Jodorowsky’s film adaptation of Frank Herbert’s best-selling novel Dune in the 1970s, and the story of that project is the subject of an amazing new documentary. The tale of Jodorowsky’s attempts to adapt Herbert’s science fiction classic is the subject of Frank Pavich’s debut film, Jodorowsky’s Dune. 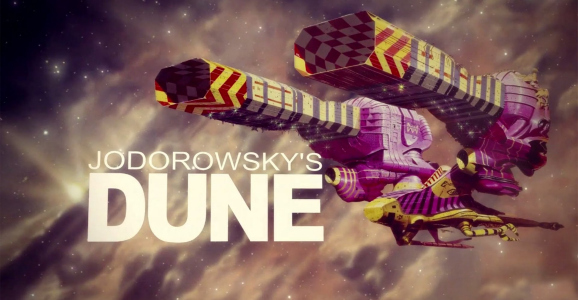 The documentary examines why Jodorowsky took on Dune as his next project after the cult success of El Topo and Holy Mountain, and how he recruited many amazing talents for the project, including Alien screenwriter Dan O’Bannon, Swiss surrealist H. R. Giger, British artist Chris Foss, and French comic artist Jean “Moebius” Giraud. When it comes to film directors with a track record of disastrously bad luck, Terry Gilliam is probably the greatest example there is. (If anyone else ends up making a Don Quixote film before I die, I’ll be so disappointed.) Gilliam could be joined on that list by French-Chilean filmmaker Alejandro Jodorowsky, but Jodorowsky only had one exceedingly insane potential disaster to his credit: his failed interpretation of Frank Herbert’s best-selling novel Dune. Honestly though, this was such a balls-out project, it does a good job of making Gilliam’s imagination seem tame in comparison. For anyone unfamiliar with this project’s story, or for those who want a detailed look at it, a celebration is in order, as Sony Pictures Classics has acquired the North American rights to Jodorowsky’s Dune, Frank Pavich’s documentary that chronicles the film’s pre-production excess. It premiered at the Cannes Film Festival in May and was met with highly positive reviews, proving that almost every film, no matter how crazy, deserves somebody’s attention.